Few vegetables have such a bad reputation with children, perhaps because of mothers' lack of creativity in preparing broccoli. I have two recipe suggestions, but more about that later. Thought to be indigenous to Italy, broccoli is but one cultivar in the Brassica oleracea group, which also includes cabbages and cauliflower. Purple broccoli (shown here) should not be confused with violet cauliflower, which is white with deep purple accents, while Romanesco "broccoli" ("broccoflower") is actually a greenish cauliflower. There is, in fact, a distinct difference between broccoli, whose firm green stalks end in florets having looser buds, and cauliflower, whose soft, thick, whitish, tuber-like stalks form a dense, roundish mass ending in clumped buds. Broccoli was cultivated by the ancient Romans, derived from the wild broccolo. This quasi-domesticated vegetable is what is often sold in western Sicily - particularly around Palermo - as "sparacelli," a word which elsewhere on the island refers to wild Sicilian asparagus. 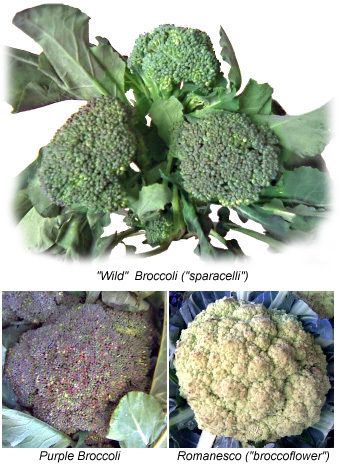 Sparacelli sometimes has a bluish cast, but not nearly as much as purple broccoli, and its buds are larger and more separated than those of the generic "Calabrian" broccoli. In general, the heads of the sparacelli broccolo are much smaller than those of Calabrian broccoli. Calabrian broccoli is the more refined vegetable sold around the world. It has a large, bulbous head similar to that of purple broccoli but usually has a deeper green colour. Broccoli aficionados and fanatics, of which there are a few, insist on the wild broccolo (sparacelli) which, compared to Calabrian broccoli, is rather tough to eat raw - especially for those who enjoy the leaves and stems as well as the florets. Ricotta and Broccoli with Spaghetti: The ideal pasta for this classic dish is whole wheat spaghetti alla chitarra (the strands are square instead of round). Boil two cups of chopped broccoli florets until tender, about four minutes, and drain. Then, in the water drained from the broccoli (to which you may have to add some), boil about a half kilogram of pasta (equal to about one pound in the US). While the pasta is hot, immediately mix in the broccoli with an equal quantity of thick ricotta cheese (the kind made from sheep's milk if you can find it) and two tablespoons of cold-pressed, extra-virgin olive oil. Depending on the salt content of the ricotta, it may not be necessary to add salt, but you may prefer a dash of ground pepper made from fresh green peppercorns. This serves four. Rustic Broccoli and Pasta: Here I also recommend whole wheat spaghetti alla chitarra (the strands are square instead of round), but any thick spaghetti will do. Boil two cups of chopped broccoli florets, along with some pieces of diced stalk and leaves, until tender, about five minutes, and drain. Then, in the water drained from the broccoli (you may need to add some more), boil about a half kilogram of pasta (equal to about one pound in the US). When it's almost cooked al dente, drain the pasta, leaving a little water in the pot, and add the cooked broccoli to it with three tablespoons of cold-pressed, extra-virgin olive oil to simmer covered for about a minute. (Ensure that there's enough water; you don't want to "fry" the pasta and the mixture should not be too dry.) Remove from heat and mix in two tablespoons of pine nuts and an equal amount of unsweetened golden raisins (you may prefer to soak the raisins and pine nuts in cold water for about an hour before you begin cooking). This dish is best enhanced by a sprinkling of sharp grated cheese, and bread crumbs which have been lightly toasted in olive oil with thinly-sliced garlic. This serves four.